One event that is always such a pleasure to cater for is a baby shower. Over recent years baby showers have gained in popularity as more and more people want to celebrate getting prepared for their baby to arrive and is often the chance to reveal the gender of the baby to friends and family. Today’s shower was for Jen and Kyle who were expecting their baby in a months’ time and thought they would throw a get together for close friends and family members before the baby arrives. Hog Roast Cookstown were enlisted to provide a light lunch and to be on hand to serve up some food and drinks to their guests. Our menu for the day was our signature Hog Roast Cookstown rolls. These rolls simply consist of slow roasted meat that our chef lovingly prepares and then carves into thick, succulent slices before placing delicately in freshly baked bread rolls. 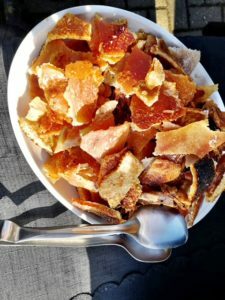 This is then topped with layers of crispy crackling that gives our sandwiches that delicious crunch and this is all finished off with a large helping of our tangy homemade applesauce. With a guest list of approximately thirty people, we brought along a small hog that we would be roasting whole in our Hog Roast Cookstown machine whilst the guests mingled and congratulated the expecting couple. Jen and Kyle told us they were going to wait and have the gender reveal done the traditional way… at the birth! Several of the guests had been eagerly awaiting the gender reveal so were a little disappointed once they found out there wasn’t going to be one, but we all agreed it just meant everyone could get even more excited for the birth itself! Our Hog Roast Cookstown rolls were devoured in no time and we found ourselves handing out lots of business cards to guests who said they loved our food so much they wanted to book us for their own events in the future. We packed up and wished Jen and Kyle all the best and asked them to let us know whether they have a beautiful baby girl or boy!